Normally when I go all quiet and can’t think what to say it’s because I’m not doing very much in terms of hobbying. At the moment though it’s the opposite, as, although I’m not going particularly quickly, I’m doing a lot of stuff at once and having fun doing it. First up, my Space Wolves. I’m busy painting more Grey Hunters at the moment. They’re a little darker in colour than my original guys, but I’m painting them up as rather more battered veterans than my first pack. 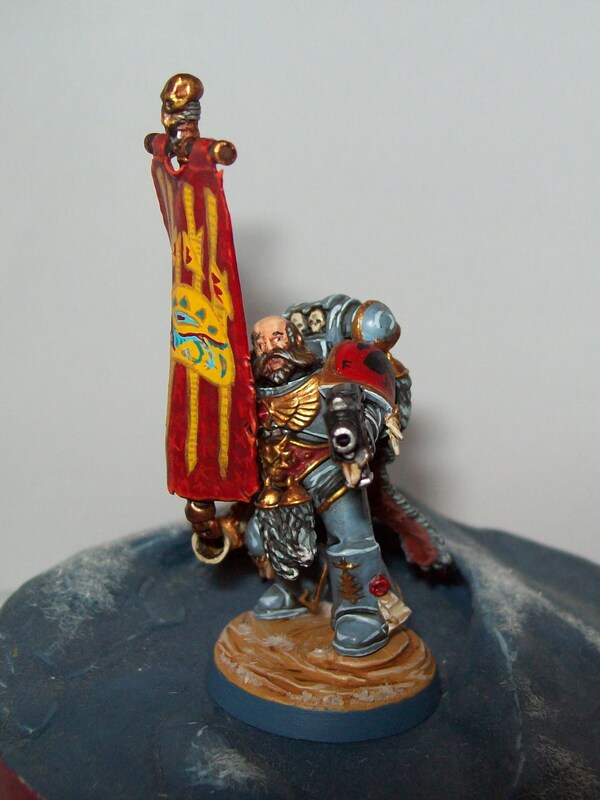 Not counting the Standard Bearer, I have two guys painted (but not based) and I’m highlighting a third. I’ve got two more waiting on the painting table and I hope to finish them off fairly quickly. Once I’ve got them finished, I’m going to build the final four members of the pack. 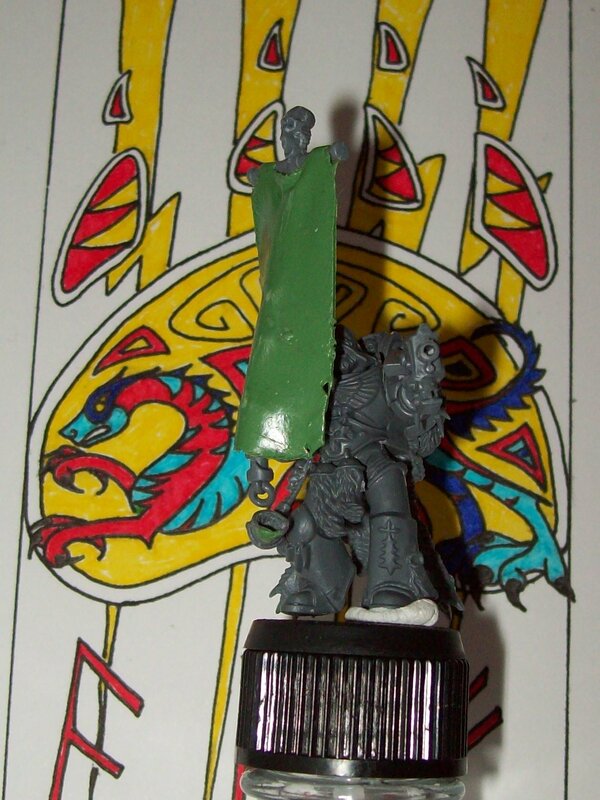 I’m also looking at freshening up my Wolf Lord. I was thinking about swapping out his lightning claw for a power sword, but I don’t seem to have the bits so I’m going to tidy up the paint and replace the broken bits. I’m planning on going through my whole army, or at least my first few efforts, touching up the paintwork and fixing any dinged up bits. It shouldn’t take too much time out of my normal model building and painting schedule. I’m also working on another project, a diorama, and that’s at the undercoat stage. I’ll post pictures up here when it’s done. 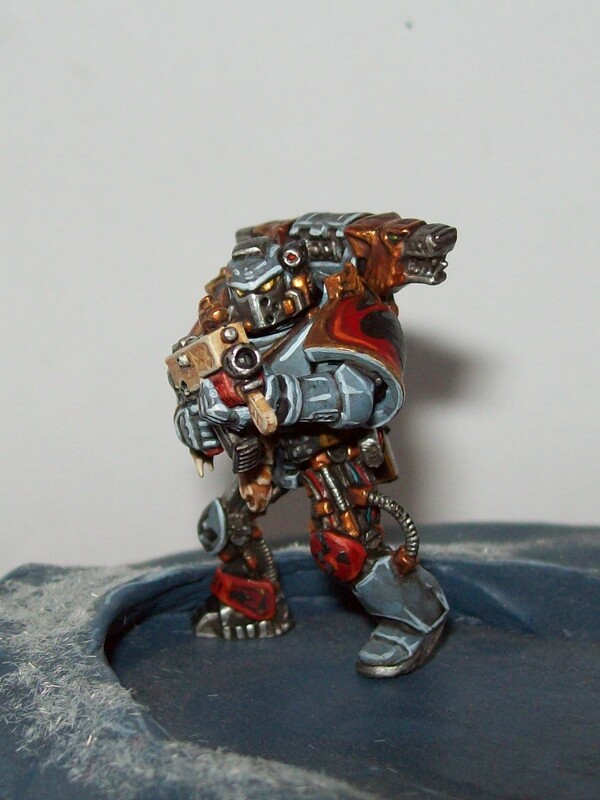 Until then, here’s a picture of one of my WIPs. He still needs a base, but I’m going to be working on that soon. I finished this guy a few weeks back (and entered him in a store competition in which he didn’t do too well) but I never got round to posting him up here. 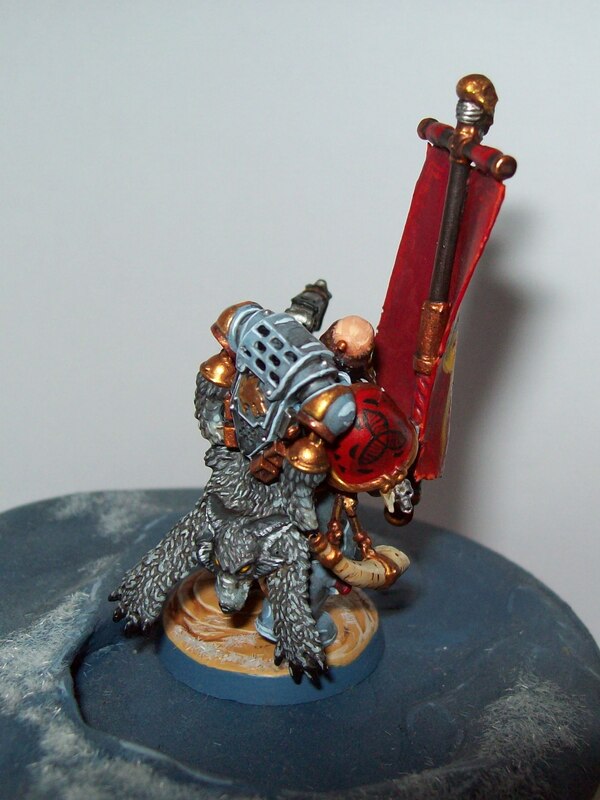 He’s a kit bash using parts from the Space Wolves Pack and the Space Wolves upgrade frame, with the horn from the Space Wolves Terminator kit (which was a bit of a nightmare to drill out and file). 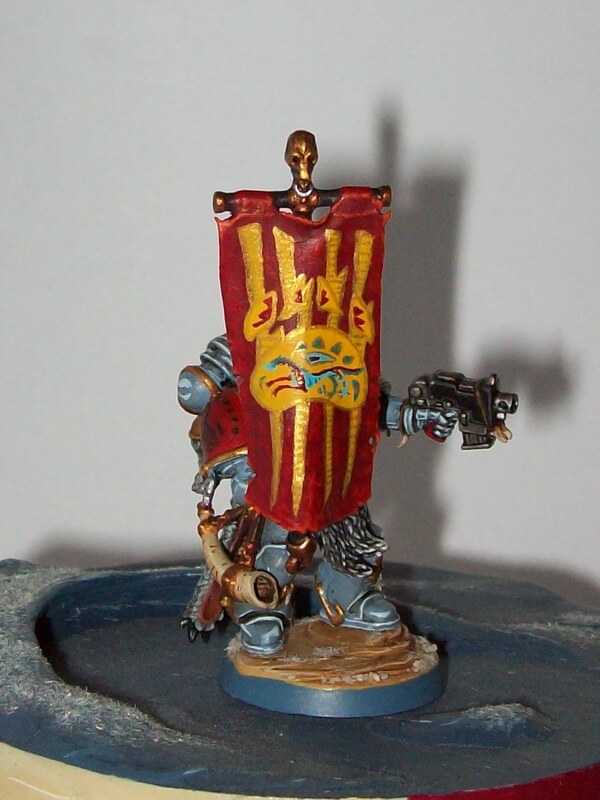 The standard itself was bashed together using a thunder hammer from the Space Wolves Pack and the pole from the upgrade frame and I used green stuff for the banner itself. The banner didn’t sit as planned, I’d wanted it to be a bit more dynamic, but gravity won out. 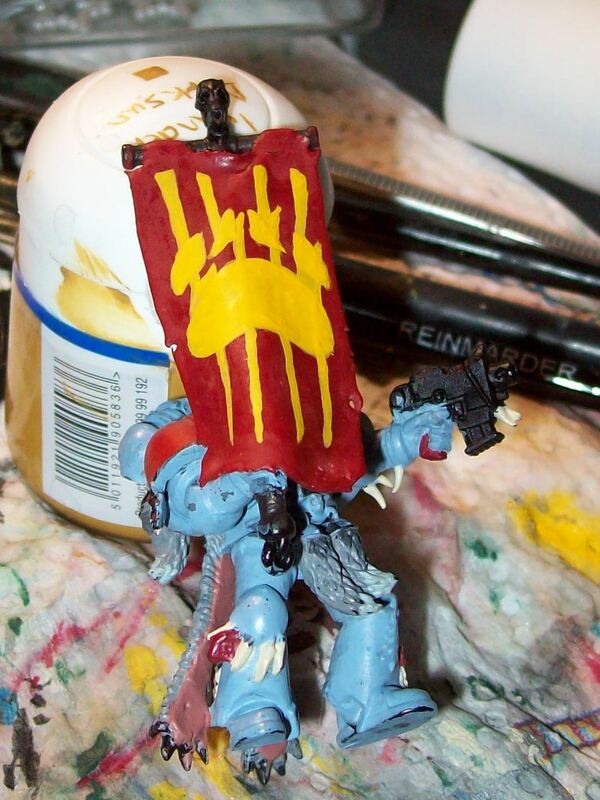 With a piece of freehand as large as the banner I plan (almost) everything in advance. I drew a large scale version of the banner in order to plan everything out. I then mentally broke everything into layers. I started by painting on the red for the background of the banner, starting with a Mechrite Red (Mephiston Red) base and a Red Gore (Wazdakka Red) layer, using highlights (blends of Red Gore and Blood Red (Evil Sunz Scarlet)) and glazes (Bloodletter) to build up the colour. 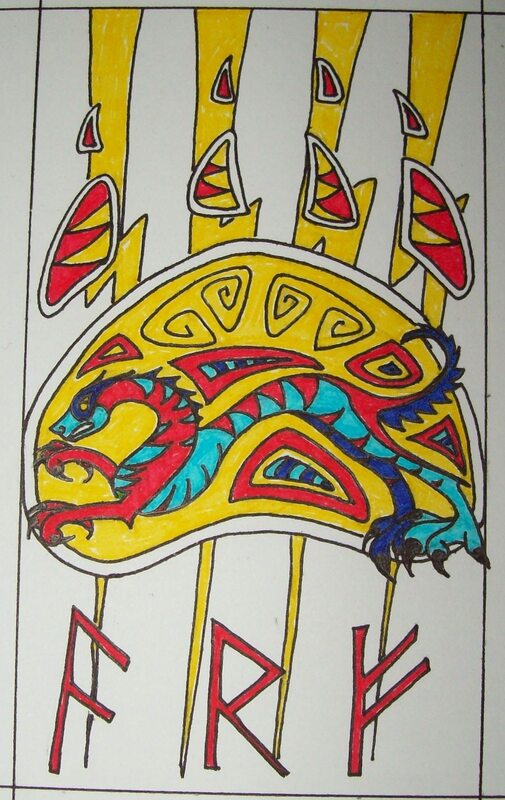 Next I added the large shapes- the claw marks and the paw print itself. I then added the smaller details colour by colour, starting with the wolf in the centre. I then decided that the banner needed something else and so I added the runes and the gold detailing round the claw marks. After washing I then highlighted everything, building up from Red Gore, through Blood Red to Troll Slayer Orange. I was careful to highlight the design, especially the runes, as well as the edges and the background “cloth”. Anyway, here he is. I hope to finish building and painting the rest of his pack soon (I’ve already posted up three of them unpainted) and use them in a game as I desperately need more troops in my army. I am, frankly, a little bit worried. My boyfriend’s copy of Death from the Skies turned up this weekend (well last week, but I needed to go and pick it up). I flicked through it on the way home, noticed that Space Wolves have flyer ace rules despite not having a flyer and returned to having a migraine (note: never travel for 35 minutes by tram with a headache and no painkillers). That’s probably why I didn’t notice that all of the 40K codices are covered in the book bar three: Tyranids, Daemons and Sisters of Battle, until my boyfriend pointed it out. It makes sense that Daemons and Tyranids are missing, they use flying monstrous creatures rather than mechanical flyers, but, Sisters? Sisters of Battle are an incredibly thematic army and the only majority female army in the game. I mean, they’re a bunch of no-nonsense, power-armoured, fanatical warriors who just happen to be female. Hey, they’re probably the closest that we’re going to get to feminist icons in the 41st Millennium! There is so much potential in Sisters of Battle, they could be a really awesome thematic army in the game, it’s what makes it so sad that they seem to have been marginalised.